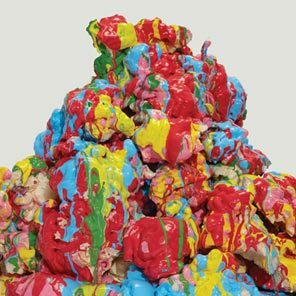 The next installment in their dripping glopness series of releases is Dross Glop, a colection of remixes for every song on their 2011 disc, Gloss Drop. Remixers include Shabazz Palaces, The Field, Gang Gang Dance, Hudson Mohawke, and many more excellent producer beings. Nonetheless, the Gui Boratto remix for “Wall Street,” which we debuted earlier this month, still remains the most awesome of all. Stream that below, along with the Kode9 remix of “Africastle” which was released today. Battles also pay homage to the remixers themselves by crafting a YouTube playlist of all the remixers HERE, and explaining why they chose each of them (below). Respectful people, these Battles guys. A Battles remix record would not be complete without a heavyweight from our friends from the KOMPAKT label. We are very excited that Gui has taken the time to rework one of our tracks. This Brazilian monster has been making club bangers for some time now and he can now add his rework of “Wall Street” to his already accomplished list of amazing tracks…….thank you Gui! Boratto Bangers: “Arquipélago”, the entire Chromaphobia album, and “Anunciacion”. Since the release of the first album by The Field entitled From Here We Go Sublime through to the most recent Looping State of Mind, we have been huge fans the music that Axel Willner makes. The Field did a fantastic remix of “Tonto” a few years back and it is with great pride that we once again call upon him for another slice of brilliance with his remix of “Sweetie & Shag”. In addition to The Field, be sure to look into Loops of Your Heart, a newer synth-heavy project by Willner, further proof that Axel has already begun carving out his own chapter of excellence in the encyclopedia of electronic music history. When we were given the opportunity to have The Alchemist rework one of our tracks we jumped at the chance. It is a complete honor for us to have “the greatest hip hop producer of all time” share his vision with us. With bangers like “More Like Us”, “Chemical Warfare (featuring Eminem)” and “Keep It Thoro” he has made his mark in more ways than one in hip hop history. Thank you DJ EMZ for hooking this up. Having always been a fan of Ishmael Butler’s groups, both past and present, we were really excited to have Shabazz Palaces be able to rework a version of “White Electric” and to drop few verses on top. We had a “feeling” that this remix was going to be good, but when we first laid ears on this track we were ecstatic at how awesome this song turned out! There is nobody like Shabazz Palaces, they are in a class of their own. Definitely check out the Black Up album, which is, in my opinion, one of the most refreshing, daring, boundary-pushing hip-hop releases in years. Not only does Steve “Kode9” Goodman make good music but he also has a doctorite in Philosophy and wrote a book called “Sonic Warfare;Sound,Affect,and the Ecology of Fear”. This alone is reason enough for him to be involved in our remix record! Best music: “Memories of the Future” and “Black Sun” both on his own Hyperdub label. We wanted to use KR because his atmospheric dark textural music sounds big and creepy in giant clubs and we wanted to see if that vibe could be conveyed in a remix of one of our songs. KR most definitely delivered. Awesome tunes include the Pruitt Lgoe 12″ and the OR LP both on the Raster-Noton label. First time caller, long time fan. Our jaws dropped when we reached out to Qluster to see if they would be interested in doing a remix for the song “Dominican Fade” and they were kind enough to oblige. Yes, Qluster (aka Cluster, Kluster), the experimental German electronic group consisting of core members Hans-Joachim Roedelius and Dieter Mobius—absolute living legends! It has been a truly humbling experience to have one our songs remixed by Qluster for they have always been a genuine source of inspiration for Battles. Gang Gang Dance has been one of the best bands in NYC for years now and they have through and through earned our whole-hearted respect and admiration. Therefore, we couldn’t imagine anybody more appropriate to remix the bizarreness that is “Ice Cream” other than Gang Gang Dance’s own Brian DeGraw. Coming off of the success of their outstanding 2011 release Eye Contact, DeGraw follows through with tons of sonic flavor for this bombastic jammy-jam of a remix. Using label mate Hudson Mohawke was a simple “no brainer”…..we knew what we would get and we couldn’t be happier. Warp’s jam master is a welcome guest for our little project. Best tracks: “Fuse”, “Gluetooth”, and “Thunder Bay”. Patrick Mahoney is the awesomeness that is the drummer behind the magnificent LCD Soundsystem. In addition to being a great drummer Patrick Mahoney is an incredible DJ, which led us to the conclusion that it could be pretty fun to see what he would do with a remix for “My Machines”. After giving us the nod of approval, Pat got in touch with producer Dennis McNany of Run-Roc records and the two of them worked out an immense nine minute dance floor banger that features Gary Numan’s one-of-a-kind vocals. A killer track!